Compare and contrast the carnivore digestive system to the herbivore digestive system and to the human digestive system. Here is the unmistakable answer to whether humans are herbivore, carnivore, or omnivore. A pure carnivore has a simple tube for an intestinal system. That tube has a bulge at the beginning of it that serves as a stomach. The tube then winds and twists inside the abdomen of the carnivore. It needs to - it is roughly 6 times longer than the animal is, when measured in a living animal. Carnivores have canine teeth, also called carnivore teeth. The adult canine teeth of a dog number 42. Canine teeth rip and tear the flesh of its prey, and the jaws chew up and down, rather than side to side. Many times the carnivore ‘wolfs’ his food nearly whole. Some carnivores can go several days before they need to hunt and feed again. Once broken down into its constituent parts, the small intestine is where the nutrients get absorbed into the blood stream. Digestion and absorption of nutrients (fat and protein) is extremely efficient. Less than 4% of fat, and just trace amounts of protein make it beyond the small intestine into the large intestine. Carnivores have NO enzymes for digesting cellulose, a complex carbohydrate and the main building block in plant cell walls. Obligate carnivores such as cats and dogs cannot digest cellulose. The cecum in a carnivore digestive system is a tiny useless appendage. In dogs, the cecum is equivalent to the human appendix. 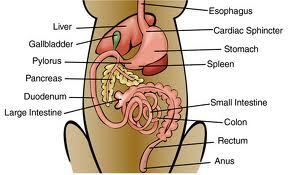 It is an S-shaped blind pouch that joins the intestines at the junction of the small and the large intestines. If it has any function, it is a very minor one. Dogs do not have an appendix. 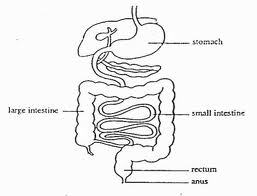 The large intestine (colon) serves a single purpose - to reabsorb the water out of the waste material. Anything left over at the other end of the long tube passes out and turns into manure. Thanks to the hydrochloric acid in the stomach, the entire carnivore digestive system is close to sterile, until the large intestine. A very large population of healthy bacteria resides in the colon. This natural gut flora participates in immune system function by competing with and helping to minimize the presence of dangerous bacteria. While the bacteria manufacture b-vitamins, biotin, vitamin K and folic acid, it is unclear whether these nutrients are bioavailable to the carnivore. Two distinct types of herbivore digestive systems exist. The horse, rabbit, gorilla and others have a single stomach and a gigantic cecum (huge blind pouch) which contains billions of bacteria and participates in digestion. The cow, goat, camel and sheep, among others, have multiple, very complex stomachs, the first three of which contain billions of bacteria that help digest plant cellulose. The herbivore's intestines are up to 27 times longer than the length of its body, when measured in a living animal. This is because the process of digesting cellulose is long and difficult, and requires the help of untold billions of bacteria which do the breaking down for the herbivore. 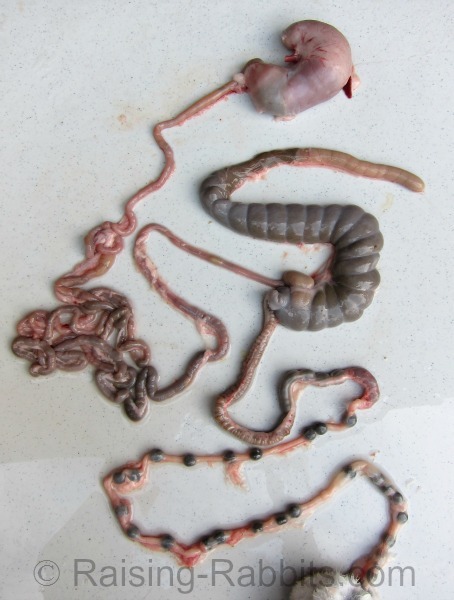 Pictured at left: the intestines of a rabbit, which is a mono-gastric non-ruminant herbivore.The largest structure is the cecum which holds bacteria and is located at the end of the small intestines. See more explanation regarding mono-gastric non-ruminant herbivores at the Herbivore page. Starting at the mouth, here is how an herbivore digestive system works. For this discussion, we’ll look at the guts of a cow, but the digestive processes in mono-gastric herbivores (above) are similar, in that a large cecum, not the stomach, is where the actual digestion takes place. In a rabbit, the cecum is also called the "hind gut," referencing its location near the end of the very long intestinal tract. Herbivores don’t have canine teeth, and they don't exactly chew. They rip grass and forages with their flat front teeth, and then their jaws move side to side as the molars grind the plant forages into a pulp. Herbivores browse and graze all day long, every day, in order to take in enough forage to subsist on. Or should we say FOUR stomachs? These huge stomachs are populated with billions upon billions of bacteria and protozoa, which begin breaking down the cellulose in the cell walls of plant fibers. This is a long process; plus, the ruminant regurgitates its cud into its mouth, and grind stuff up all over again. 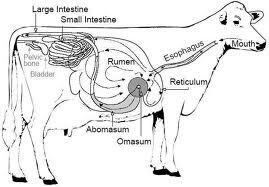 The first three stomachs, the rumen, reticulum, and omasum, are concerned with breaking down the plant fibers in preparation for digestion. The work is mainly done by bacteria. True digestion finally occurs in the fourth stomach, the abomasum. Glands produce hydrochloric acid, pepsin and lipase which finish breaking down the food into all of its constituent nutrients. The abomasum doesn’t just digest the food; it also kills, liquefies and digests the billions of life forms that have been participating in the animal’s digestion as the digesta has been passing through the three previous stomach chambers. In this way, an herbivore manages to absorb "animal protein" from the bacteria, despite eating only plant matter. Herbivores cannot by themselves digest cellulose any more than dogs (or other carnivore digestive systems) or humans can. But, they utilize a huge army of bacteria and other life forms to break down the cellulose before digestion. Once the bacteria have broken down the cellulose, the herbivore digests the bacteria for dinner, thereby obtaining animal protein (and vitamin B12, by the way) despite eating only plants. How’s that for a thank-you? Nutrients (small intestine) and liquid (large intestine) are absorbed into the body. The intestines of the complex herbivore are 'wasteful' - 50% of the food and nutrients pass out without being absorbed. The human digestive tract bears NO resemblance to that of herbivores. Dogs and humans have canine teeth. Small intestine, appendix (cecum) and colon have identical functions in human and carnivore digestive systems, though there are a couple physical differences. Humans don't have a cecum, per se. Instead, the beginning of the large intestine is called the 'cecum.' It is nothing more than a segment of the colon. The appendix which has no known use, is attached to the large intestine at the junction of small and large intestines. Dogs have no appendix, but at the spot where the small intestine joins the large intestine, dogs have a small, S-shaped appendage named the cecum which serves the dog about like the human appendix does humans - its use is minor or undetermined. Human digestion does not break down plant materials efficiently. Unlike herbivores, we are not equipped to digest cellulose. Dogs cannot break down carbohydrates at all. But human saliva contains amylase, which can digest carbohydrates (but not cellulose, which is too complex for amylase). This is why humans are categorized as omnivores, while also having a carnivore-like digestive system. Humans should be eating a LOT MORE MEAT and animal fat (needs to be grass fed and grass-finished), and a lot less carbohydrates, especially refined carbs and grains (including whole grains). I know this flies in the face of quite a bit of currently accepted dietary theory. Current dietary recommendations have been around for 50+ years, and has strongly favored a quasi-vegetarian dietary regime (80% carb, 20% fat, 20% protein). If these dietary guidelines were even half effective, Americans would be getting healthier. As it is, on the current low fat, high carb guidelines, every known chronic degenerative disease has reached epidemic proportions, and 66.7% of Americans are not just overweight, but obese. Something's wrong with THAT picture. Low fat, high carb is not producing health. If what we’re doing isn’t working, don’t you think we should be trying something different already?? "Great page. Of course we're omnivores." "I completely disagree. We're herbivores." "Yes, I know we can't get B12 from plant sources but since we're brilliant humans, we can always just supplement with B12." Sure, supplement away. But seriously, do I even have to point out that if your digestive processes can't provide for you the essential-to-life B12 without eating meat, you might be an omnivore?? At any rate, thanks so much for the discussion. And because no one is actually changing anyone's mind, I challenge ALL participants to pack up your microphones and trek on over to our HERBIVORE page. This is where we briefly explore not just structure but the underlying function of herbivore digestion as compared with human digestion. I would love to see how the discussion evolves with the interjection of a little more light on the subject.